You'll love this book, the recipes are easy, the ingredients are easy to get and they don't take long to make. 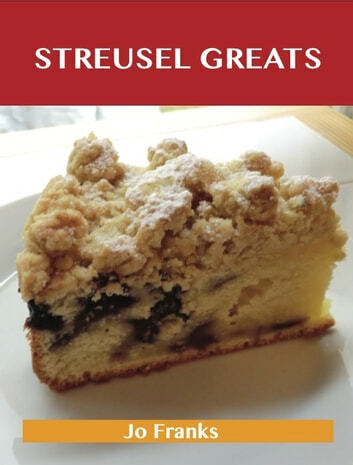 Foodlovers turn to Streusel Greats for information and inspiration. Everything is in here, from the proverbial soup to nuts: Almond-Streusel Peach Pie, Amish Apple Pie, Any-Fruit-Will-Do Muffins With Streusel Topping, Apple and Almond Streusel Cake, Sweet Potato Pie with Hazelnut Streusel, Underripe Peach Pie Wit Pecan Streusel, Walnut Streusel French Toast With Caramelized Apples, Zucchini-streusel Bundt Cake...and much much more! Streusel Greats is packed with more information than you could imagine. 73 delicious dishes covering everything, each employing ingredients that should be simple to find and include Streusel. This cookbook offers great value and would make a fabulous gift.